I recently had Julia Konovalova’s cookbook, The Ultimate One-Pan Oven, sent to me to review from Food Bloggers of Canada. 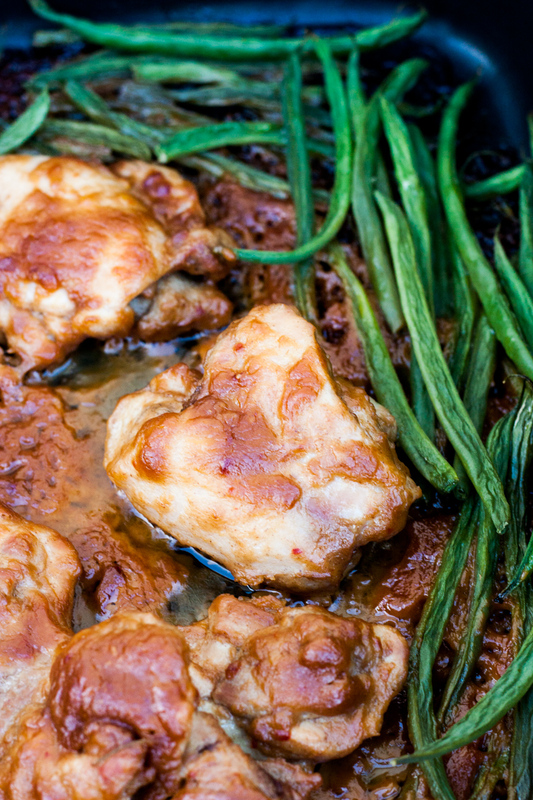 I prepared one dish from the book for my review: Easy Chicken Thighs in Peanut Sauce with Green Beans. It was soooo good. 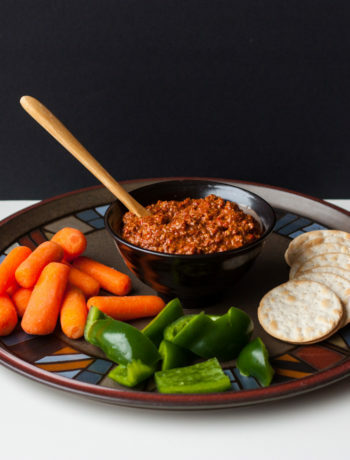 I’ve tried a lot of homemade peanut sauces over the years, with most recipes being duds, but this one was tasty and full of flavour. If you’re interested in family-friendly, easy and delicious recipes, read on. The Ultimate One-Pan Oven Cookbook was written by blogger Julia Konovalova, creator of Imagelicious. I have to admit, this is my first cookbook review. I have been reading cookbooks since I was a little girl, and somehow thought this would be a fun and easy activity. Well, of course, browsing through any cookbook is fun, but reviewing one is not as easy as I thought. I realized as I was going through this book, that there is a lot more to a good cookbook than just the recipes. Everything about the book has to make you want to use it: the photos, the names of the recipes, the layout of the book, the style of writing, the categories of recipes and of course, the recipe instructions. I will break my review down into the categories mentioned above. 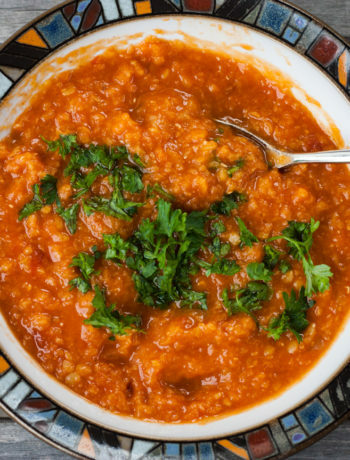 Every recipe in this book is complimented with an eye-popping, mouth-watering photograph. I love that the photographs are light and bright and really expose the natural look of each dish and are not over edited. The dishes look just the way they would on your kitchen table at suppertime. And that’s nice. While browsing through the cookbook, I was drooling over the food adjective-heavy names. She includes recipes such as Cocoa-Rubbed Pork Back Ribs with Chocolate BBQ Sauce, or Roasted Berries with Orange Mascarpone. The names, ingredients, accoutrements – so simple, so delicous-sounding. I really like the layout of this book. The book starts out with a short two-page intro of how Julia got interested in cooking, as well as what she likes and doesn’t like. This helps the reader decide quite early on if they’re on the same page as the author. Julia doesn’t like stress in the kitchen. She likes healthy family-friendly recipes with minimal effort and washing up. Also, the abundance of photos really entices the reader to use the book. Julia’s experience as a food blogger is evident in the personal anecdotes she includes at the beginning of every recipe. She always has a nice paragraph at the beginning of every recipe explaining what she loves about a particular ingredient in the recipe on the page. Her comments and dialogue are very insightful and help us get to know her and learn what is important to her: her family, fresh produce and a no-muss no-fuss style of cooking. This book is so perfect for people that love home cooked meals, but don’t want to spend hours in the kitchen preparing and cooking dinner. I love the categories in this book. Because this book is primarily savoury dishes, with ten sweet dishes at the end, all baked in a pan in the oven, it could be challenging to divide the recipes into interesting and different groups. But her categories are brilliant: Oven-Made Breakfasts, Complete One-Pan Oven Meals; Hands-Off Main Dishes, Simple Soups, Salads and Sandwiches, Easy Sides, One Pan, Many Nibbles and ending with Delicious and Unique Desserts. The instructions are clear and precise. I like how she uses metric and imperial measurements, as we Canadians still use a mix of both. She also has many helpful Notes at the bottom of the recipe. If you’re looking for a cookbook as a gift this Christmas, definitely have a browse through this book. It is full of imagination, creativity and some very delicious meals anyone would be happy to prepare for suppertime. Here’s a link to her cookbook on Amazon.ca The Ultimate One-Pan Oven Cookbook by Julia Konovalova. Preheat the oven to 425 degrees F (218 C). 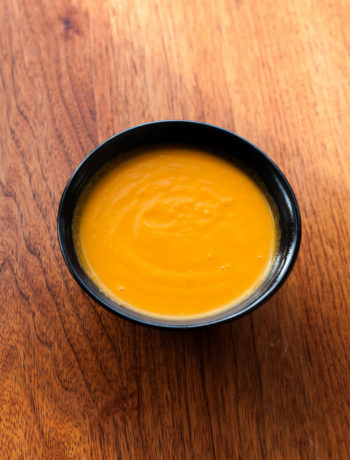 While the oven is preheating, mix 1 tbsp (15 ml) of the olive oil with the peanut butter, lemon juice, orange juice, soy sauce, and Sriracha in a bowl. (Julia mentions that she likes to use a small glass jug for this. She recommends heating the sauce ingredients, as it's much easier to mix when the peanut butter is warm). Place the chicken thighs in the middle of a 11 X 17 inch or 28 X 43 cm nonstick baking pan. You need room for all the ingredients to spread out. Make sure that the chicken thighs are fully flattened. Pour half the sauce over the thighs, then flip and pour the rest of the sauce, making sure that it fully covers the chicken. Alternately, you could mix the thighs in a bowl with the sauce. However, that would add one extra dish to your washing up. 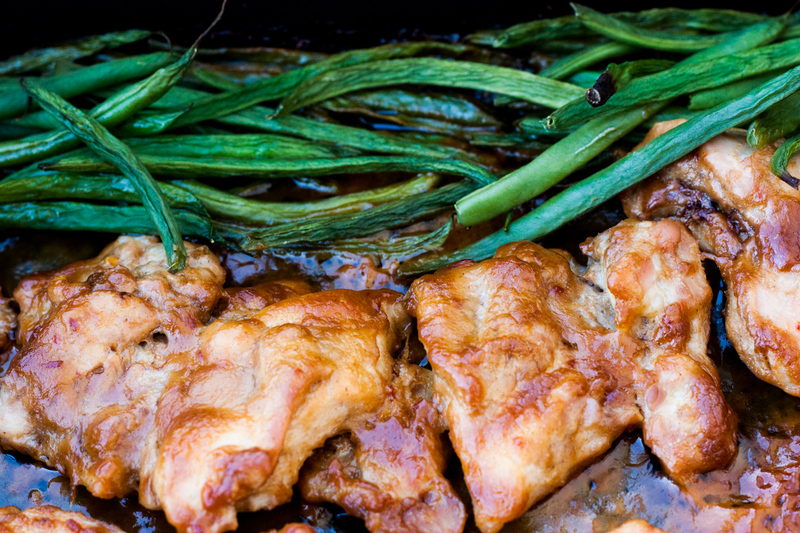 Spread the green beans around the chicken thighs in one layer. Pour the remaining 1 tbsp (30 ml) of olive oil over the green beans, season with salt and pepper to taste and lightly mix with your hands or tongs to cover them with oil and seasoning. Roast for 30 minutes, or until the chicken thighs are cooked to 165 degrees F (74 C) and the sauce is thickened. Serve with rice, if desired, or double the amount of green beans and cook on a separate pan. Thank you for your lovely words! I am so happy that you liked the book. It really means a lot to me! Thank you! Thank you so much, Julia. My family really love the dishes I make from your book.